The router is a tool that you do not have to have to build a boat. Again, it just makes some things simpler. As a side note – it takes some skill to work with a router, but it is all just a matter of practice. Just don’t rush to routing chine log slots to your floorboards as a first time project. I am not going to go into the details of working with one. Perhaps that you need to wear eye and ear protection. 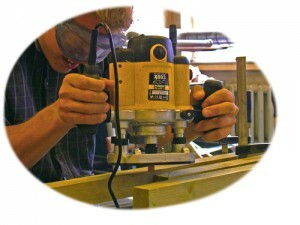 The plunge router provides superior speed when compared to the chisel for example. We use the router for finishing bulkhead edges, creating floorboard slots. Perhaps the most important use is for creating lap joints. Lap joints are the best for elongating plywood boards, it offers optimum flexibility and does not create stress zones. That will be covered by another article. You do not need the router, but when you know how to use it – then it is a very useful tool.